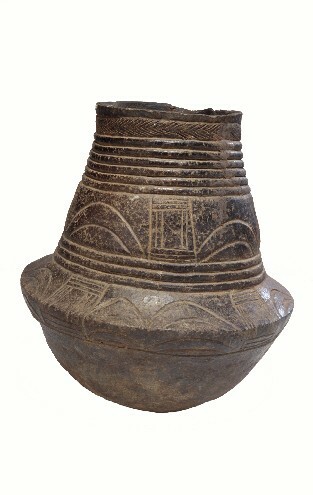 Utilitarian objects such as this vessel from the Songye culture were used for such daily purposes as storing food, water or beer. In some cases the vessel would be used in special ceremonies or as a part of a shrine. Among the Songye, primarily women hand-build, decorate, paint and fire such wide-mouthed, dark-colored vessels. The decorative, incised carving is achieved with fingers, a roulette, and other tools. The ridged surface facilitates the handling of a wet vessel. Similar objects are in the collection of the National Museum of African Art, Washington, D.C.
National Museum of African Art, Smithsonian, 2002, ob.89.13.2, 89.13.1.